PlayerUnknown’s Battlegrounds is better in third-person, so why the love for first-person? PlayerUnknown’s Battlegrounds has taken the world by storm. In around six months it has managed to exceed one million concurrent players with over six million copies sold, and it is still in Steam Early Access. Battle royale games are in vogue right now, as proven by the likes of H1Z1: King of the Kill also enjoying a rise in popularity, and bigger teams like Epic Games adding a battle royale mode to Fortnite. But it is PUBG that still holds the poultry-chomping top spot. The first-person and third-person mode isn’t all that divides the PUBG community – it’s quite the mess these days. 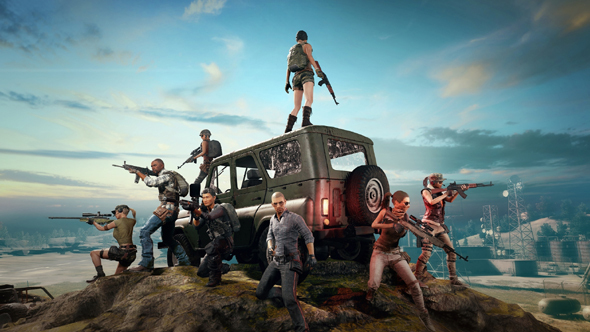 Due to such sudden and unpredictable popularity, PUBG developers Bluehole have struggled to keep up with the demands of their players. One of the big features requested by the community for a long time was a proper first-person mode. In August, Bluehole was able to deliver, rolling out first-person servers for the game across most regions. Before then, third-person mode was the default way everyone played the game. You could switch to a first-person perspective if you liked, but as you’re in a server with most people playing in third-person, it put you at a severe disadvantage. When the first-person mode arrived a large number of the most popular streamers immediately migrated to those servers. The reasons they gave varied, but a lot of it boiled down to people perceiving first-person shooters as requiring more skill than third-person ones. There has since been a large push for the first-person mode to be the game’s default one. The September update helped with this by bringing leaderboards to the new mode. With so many streamers and posts on /r/PUBATTLEGROUNDS in favour of first-person over third-person, it can be hard to find viewpoints that push for the latter as being the better mode. While it is subjective to an extent, something very important could be lost if first-person becomes the de facto mode. You see, first-person PUBG is more about dexterity and quick reactions. You must expose yourself to gain vital information about the battlefield ahead of you, and while doing that, if you can see an enemy that means they can see and shoot you – that’s not always the case in third-person mode. This moves the focus onto who is better at shooting in a head-to-head situation. Who can gain the most information in the shortest amount of time by peeking round a corner? Can the opposing player react fast enough to take the shot that punishes that peek? Who can control their spray better? Who knows how to use their weapon better in that specific situation? These questions, while interesting, are asked by lots of games. Battlefield and Call of Duty have an entirely different setting and their own idiosyncratic mechanics, but they also ask those same questions. PUBG, on the other hand, is actually a role-playing game. You are playing out the story of “The Run.” The run where you get the sniper and the suppressor. 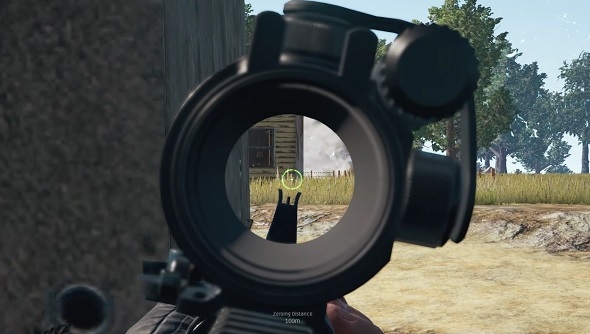 You find an 8x scope. You clean house and then, eventually, you eat chicken. Perhaps this story is a tragedy. Maybe you don’t eat chicken, but instead have to deal with the guy who decided that, when he flipped his car onto its roof, he would hide inside so he could pop out and… well… he has a suppressed sniper rifle with an 8x scope. You find equipment and weapons, you find vehicles, you go back for fuel for those vehicles… it is not the same as other competitive games because they generally have matchmaking systems and game modes that help you win about 50% percent of your matches. If you can win half of your PUBG games then you are effectively a god of the game. 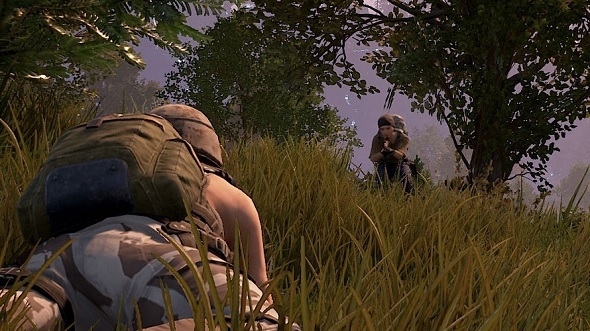 Third-person mode amplifies what makes PUBG different to those other games – that feeling of being the character in a desperate, unpredictable story. 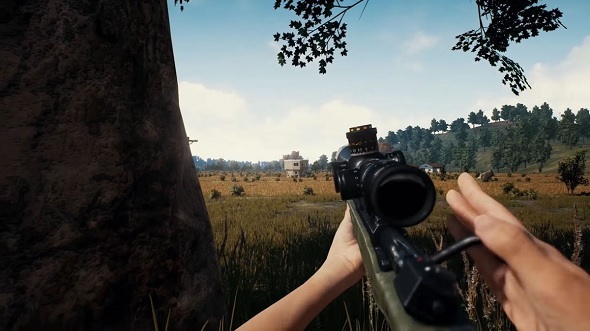 However, the most important thing PUBG’s third-person mode brings to the table is this: you have to think a lot more about your positioning as everybody has a larger field of view. You can see to the sides and over the top of objects that are close to you, such as the walls found throughout the map. You can even see behind your on-screen character a little. This increases the chances that other people can see you while you can’t see them. You find yourself paranoid that somebody is out there aiming right at you. Take a second to remember all the times you saw someone but decided not to shoot at them. Now think about how many times people might have decided not to shoot you… It’s a scary thought. Positioning yourself somewhere to take advantage of the extra information you get from the third-person view is easy. Positioning yourself to deny someone else the advantage of seeing you is hard. You have to make all your decisions based on thoughts like, ‘What if there’s a guy right there?’, and it is difficult to maintain that level of vigilance. The first-person mode takes some of that away. When the viewpoint, and therefore the available information, is restricted for both players strategy is fulfilled through mechanics more than it is through intel. In third-person, you can be awful at aiming, but if you know where another player is and they don’t know where you are, it can be easy to get a kill. In first-person mode, you have to push that person, force them to open themselves up for the kill. You, too, have to expose yourself for long enough to aim and fire, and if your opponent reacts quicker than you then you have to go back to safety – you cannot watch to see what they do and make a plan like you can in third-person mode. It is easy to understand why people call this scattier form of play more skillful, however. Physical and mechanical prowess is simpler to measure, quantify, or relate to your own abilities in the first-person perspective. This viewpoint is helped along by the fact that most of the popular PUBG streamers are FPS players at heart. They come from Call of Duty, Battlefield, even Team Fortress 2. Those games focus on mechanics, so the first-person perspective serves their skills better than third-person. But PUBG is all about dealing with an uneven playing field. You can’t guarantee that you have the best weapons. Sometimes, the game seems to decide that today is not your day, and will spawn you in the worst spot imaginable – devoid of loot, while the guy in the next warehouse over is at level three across the board. It is all about making the best of what you have. You only need to look at the top players to see how you can push the percentages – making the RNG less likely to punish you – to be consistently successful over a large number of games. Success comes from continually making decisions in anticipation of the future. 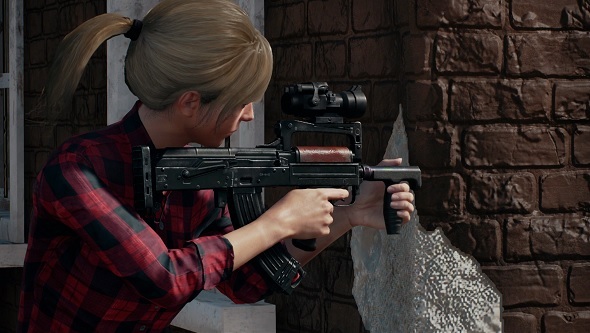 Picking up attachments that don’t fit your gun is a great example of this – they might come in useful when, later on, you find a sniper rifle and can immediately kit it out. The beauty of the game is in learning how to tilt this uneven playing field to your advantage. Using the systems as best you can with the RNG gods shining down from on high. In a game where your most common action can be reduced to ‘run to circle’ – that is, avoiding the encroaching electricity field that slowly shrinks the playable area – movement becomes absolutely key. Consider that this is a game in which it is possible to win without ever firing a shot, or even picking up a gun. Surely that proves positioning is the most important thing to consider. And it is the third-person mode that best caters to this. Bluehole seem to support this outlook with the upcoming vaulting and traversal changes forecast for November. At the moment, players can only crouch-jump through windows or overcome them with similarly awkward movement exploits. However, in the September update, they removed the ability to bind both crouch and jump to one key, making this much harder to do. 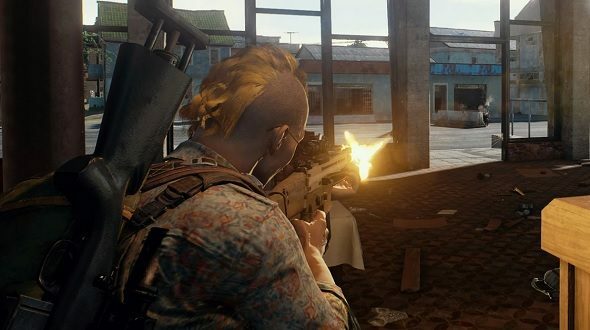 Perhaps Bluehole are in two minds about whether they should focus on first-person or third-person matches for the game’s future. It is great that community feedback is directly impacting the game, but it is dangerous to simply listen to the loudest voices. For all the support the first-person perspective has, the counterargument suggests that it could reduce the value of positioning and instead place it on more immediate mechanics. The third-person view does the opposite of that, and it could be the reason PUBG has seen the meteoric success it has. There are very few other shooters that enable the kind of experience that third-person Battlegrounds encourages. It would be a great shame to lose even part of that.